In the English language, we use conjunctions to link two words, clauses, phrases or sentences. These are used to add coherence in your piece of writing, by joining essential components within or between the sentences. There are various types of conjunctions such as coordinating conjunctions, correlative conjunctions and subordinating conjunctions. Coordinating conjunctions are the linking words that link ideas of equal importance, function or structure. Correlative conjunctions are one that works in pair, with both the words working along in order to create a balance in words, phrases or clauses such as either…or, neither…nor, whether…or, not only. Lastly, subordinating conjunctions are used to add a subordinate clause to an independent clause. 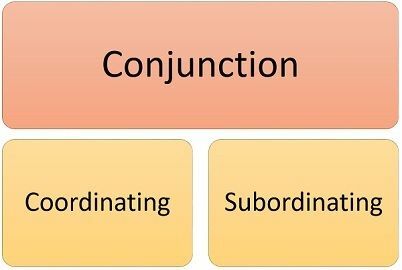 In this article, we are going to discuss the difference between coordinating and subordinating conjunctions. Meaning Coordinating Conjunctions links two or more words, clauses, phrases or sentences of equal importance. Subordinating Conjunction are the words that links a dependent clause to an independent clause. Coordinating Conjunctions or Coordinators refers to the linking words that connect two or more nouns, verbs, adjectives, independent clauses or sentences. It usually connects two units of similar grammatical type and syntactic significance. Further, it gives equal importance to the pair of main clauses. Subordinating Conjunction or subordinators are used to join two clauses wherein one is dependent and the other is independent. The dependent clause provides additional information which is may or may not be necessary. On the other hand, an independent clause is a standalone clause. Subordinate Conjunction stresses on the idea in the main (independent) clause than in the subordinate (dependent) clause. Further, it expresses a change amidst the two ideas in the sentence in terms of time, place or cause and effect relationship. These are after, although, before, that, though, whether, unless, until, then, that, where, while, even if, so that, rather than, because, etc. Further, we also use a comma when the dependent clause is placed first, in order to separate the two clauses. However, if the independent clause comes first, no comma is placed. Coordinating conjunctions join two words, clauses or sentences of same grammatical relevance. Subordinating conjunction implies a linking word that joins the dependent clause with an independent clause. The connection formed with the help of coordinators is weaker in comparison to the connection formed by subordinators. Coordinating conjunction joins two independent clauses. Conversely, the subordinating clause joins a dependent clause with an independent clause. The sentence formed after adding a coordinating conjunction to join two equivalent clauses is a compound sentence. In contrast, complex sentences are formed after adding subordinating conjunction. Coordinating Conjunction is placed at the middle of two words, phrases, independent clauses or sentences. On the other hand, the subordinating conjunction is positioned before a dependent clause. Although, there are instances when a dependent clause appears before an independent clause. Conjunctions are used in sentences to express an additional or contrasting idea, to show cause and effect relationship, to show purpose, to show the relationship of time and place. Coordinating conjunction joins two elements of a similar kind, wherein the two elements do not rely on each other. On the other hand, the subordinating conjunction joins the subordinate clause with the main clause to provide extra details.